The sun has gone down 7 times since this race, and I have this report now to share. The weather was beautiful, the cool breeze, the sun adding light to the brilliant colours of the rock faces, the wildlife and the most stunning terrain; it was almost a shame to have to run through this course and not stop for a while to just take it all in a little longer. Friendships formed and solidified, sportsmanship, camaraderie, guts, determination, brilliant athleticism, disappointment and elation...I saw and/or experienced it all on Saturday. So here is a little race report of the 10 hours and 2 and a bit minutes that I was on the course for. Early days of the race, when Ryan was still in view! The start was SUICIDAL!! Yes the conditions were great but somehow my prerace plan of hanging back went right out the window after 100m and it was game on! 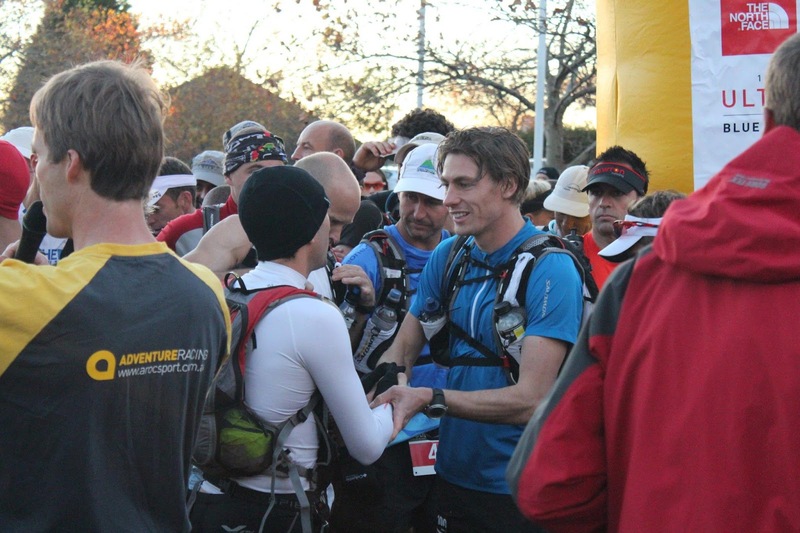 I wanted to run with Ryan Sandes and introduce myself and thankfully I got to do that before he took off after Andy Lee who was hell bent on getting to the beautiful views at Leura first. Going into Leaura Forest it was a pack of chasers; Ryan, Mick Donges, Jim Villiers, Vajin Armstrong, Matt Cooper and myself. I'm pretty sure we were all blowing hard chasing after Andy. Entering the trail leading to the Landslide, Jim took off and was out of sight in no time. I'm nicknaming him Mr Natural, he has the smoothest running style I've seen from an ultra runner. The climb up The Golden Stairs was the first taste of what was to be a common occurrence all day, Vajin powered right by on the short but steep ascent. that's me on the very right! Vajin and I reached the first checkpoint and we both filled our bladders. I think we both had the same hydration plan for most of the day - start with empty bladders and then fill about 1 - 1.5L at checkpoints. I was also carrying a small 450mL drink bottle in my compression shorts that let me carry some electrolytes or Perpetuem. Along Narrowneck, Vajin and I just passed time by chatting about our goals for the year and the experiences of the World 100k for me and Tarawerra for him, our last big races. Vajin was asking questions about the course and I found that gave me a good chance to think about the tactics needed for the race ahead. Vajin and I, on pure running strengths, are pretty similarly matched on the flattish terrain. He would always pull away on the steeper ups or stairs, but I would rein him in on the techy, single track stuff. The only previous time I've raced him was on the flattish Commonwealth Champs course last year, I managed to stay in front of him all race. I knew on this terrain that he is a much different runner. What this meant is that we pretty much yo-yoed all day. 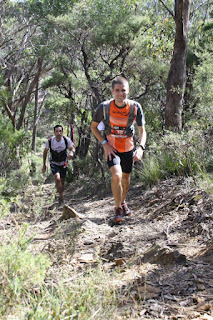 But back to Narrowneck...Vajin and I were pacing each other well without racing each other which was a relief from the frantic start. I was very happy running with Vajin, he is a very relaxed runner and his general warmth and positivity helped me to stay composed and get my race back on track. We were momentarily interrupted by a big flock of black cockatoos screeching and flying gracefully in the early morning air. Vajin commented about how rambunctious our birdlife is compared to NZ's feathered varieties. Down the ladders and along the singletrack to the Medlow Gap I pulled a little away. Onto the firetrail I saw Andy Lee emerge from the bush wiping his hands together with ferns, didn't take much to work out what he had been doing, so fair to say I gave him a wide berth for a while as we continued along the trail! I enjoyed the time with Andy, someone I admire very much. He only lives a couple of suburbs away but I never see out training to catch up with much. As we approached the Bellbird Ridge left turn, I mentioned to Andy that we have to keep an eye out for the turn. 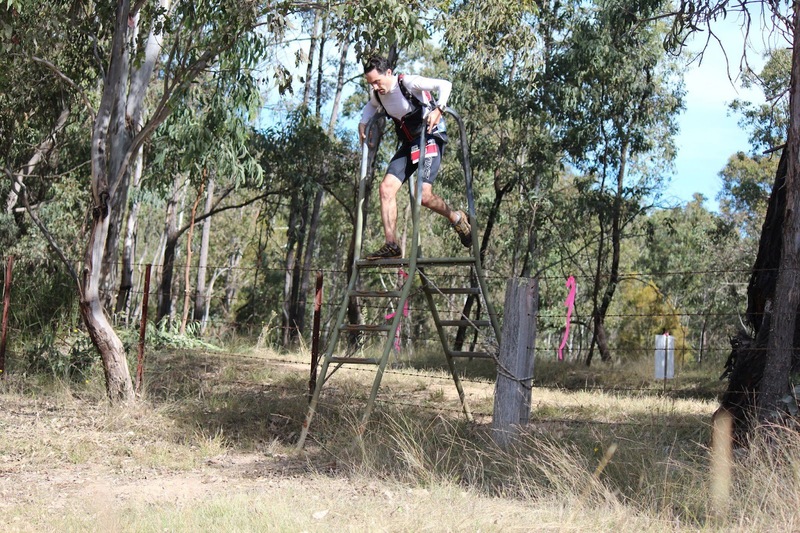 In previous training runs, on one particular run with Ewan, Mick Miles and Alex Mathews, we missed the turn and ran all the way to the locked gate at the private property 4km up the trail. It hadn't dawned on me that there was a lack of tape along the trail leading up to the turn; it only really hit home when we reached the turnoff and there was nothing pointing us down the trail nor nothing stopping us from going straight (usually indicated by a cross). At this point, I think the luckiest guy here was Vajin. He had just rejoined Andy and I less than a km earlier. I know he believes in karma and I guess this was an example of how it comes back in kind! I called out 'the trail is down this way' or something like that as Vajin who was a metre or two ahead turned and saw Andy and I head down the trail. Unfortunately and very sadly for all involved in the race some of the runners behind were not as fortunate and continued on in the way you would assume to go with no markings - straight. What makes it worse too is that the straight is the more groomed trail. Logically it is the right thing to do. These guys were very unlucky as: one - no one in the group knew the course, and two - they arrived at that point between us informing the marshals at CP2 what was going on and them getting up there to marshal the competitors the right way. The transition at Dunphys Campground was smooth with a gear check thrown in for good measure and I was on my way before Andy or Vajin. I downed another GU (I was on a 35 minute schedule) and rehydrated knowing the climb what lay ahead would be very energy sapping. Reaching the bottom of Iron Pot, I decided to take the most direct line to the summit, even if it was the more difficult way. I felt as if I climbed this well, powerwalking and using the trees to haul myself up in sections. As soon as it began flattening out I ran again. Halfway on the way out on the ridge I saw Ryan coming back to me from the turnaround. We wished each other a good race and I checked the watch to get some idea of how far behind I was. It took me about 2 minutes to reach the turnaround so I estimated I was 4-5 minutes behind. After the turnaround some of the guys I was visualising seeing runnig towards mewere not there...where was good mate Clarke McClymont? Where was Jez Bragg? I know he starts steadily but surely he wouldn't give the leaders that much of a start? What about Chris Wight, my dark horse for the event, Jim Villiers who had started so strongly and Damon Goerke?. They were all missing. Post race I was to find out there were 8 all up that got caught out by the stolen markings, while others had pulled the pin by this stage too. I did however see a bunch of other usual suspects in hot pursuit; Mick, Matt, Andrew Tuckey and Grant Guise. I knew I had my work cut out for me to hold down a top 3 spot with these guys on my tail! Coming off Iron Pot, I used the steep downhills to my advantage, the grip of my X-Talons coming into their own. The well placed trees also copped the full force of my body weight acting as brakes on the steep descent. At the bottom I climbed the couple of short, steep hills after the creek and downed a couple of GUs. I was feeling great and ready to tackle the big climb on the road. Last year I had walked a lot of these hills after the 'saddleyards'. This year I was hell bent on running all the way and that I did and I felt great. The splits show I was 2nd fastest on this leg (also the 2nd leg too) and that didn't surprise me. The climbs have never been my strongest point, I am much more at home on undulating firetrail, yet that climb was surprisingly easy. I pulled away from Vajin and Mick and knew I had to make the most of it. The gradual downhill to CP3 was great, I was really motoring; possibly sub 4 minute kms here. I was relieved to get to the Checkpoint and see Nadine. I found her pretty quickly and had the bladder out ready for the changeover (I had a spare bladder ready to go in). I also restocked my GUs and Clif Shot Chews that I was chowing down every half an hour or so. I think I was there a minute or so but that minute is great just to settle the heart rate and have a small breather. A kiss goodbye and I was on my way again with Race Director Tom pacing me for the first kilometre or so (and also doing up my pack...thanks Tom!). We had a chat about how beautiful the course was, how awesome the Didge sounded up on the ridge played by the Aboriginals and the great weather. I didn't hear or see anyone come into the CP so I knew I had opened up a handy lead on whoever was behind me. The next section's goal was simple - run to the first step of Nellies Glen and then powerwalk up them as quick as possible. I ran this section well, the small hills up to Nellies not stopping my momentum. I reached the sign of Nellies Glen and continued to run all the way up to the first step. About a quarter of the way up the steps I heard 'how are you going Brendan' and it was Vajin. I didn't expect him so soon, he must have been 'putting in' up to there too. We again had an exchange about the course and he was surprised to hear that the steps we were walking up were basically the start of the 6 Foot Track. We eventually left Nellies behind and started on the Fern Gully section of the course. I really love the scenery here but I don't like the steps, it seemed every time we came to a flight Vajin would pull away from me. Thankfully there were enough short downs to even the score. Coming out of the bush into the street at Katoomba, we ran past Ben Berriman and Sleep Train, the second time I saw them on the course. I did a really brief introduction of Vajin to SL; the much admired 6 Foot Track record holder was a topic of an earlier conversation Vajin and I had on Narrowneck. Along the road to the Aquatic Centre I was given some good news by the guy on the bike who informed us that the pants and fleece did not need to be carried from the checkpoint. This was a relief. Vajin and I came into the Aquatic Centre together. I found Nadine and restocked my GUs and Perpetuem and downed some Coke, Water and Gatorade; not very scientific but it was doing the job! I wanted to get away quickly at the CPs, and although they were all in the 1-2 minute range which is fast relative to the entire field, I am already planning how to cut these back next year. The next leg is both my favourite and my most feared. I love the stairs and the downhills but Kedumba has never been overly gracious in the way she welcomes me as a guest. The little gap I put on Vajin due to the quicker transition at CP4 soon evaporated as he effortlessly loped past on the 'new course' section of road to Echo Point. I dug deep and was determined to gap him on the stairs and downhills. The problem was that we were enjoying our company together too much; scaring the life out of tourists coming down the stairs and generally just loving the trail. I warned him that we would have to use our voices in this section, so he graciously let me lead...I have no problem shouting out 'runners coming through!'. They better get used to it anyway with 800 or so others behind! 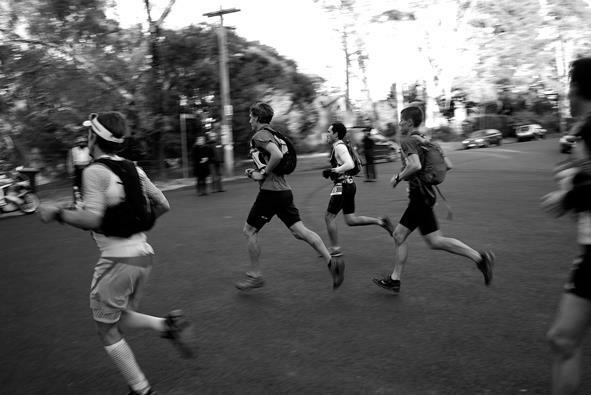 Reaching the federal pass we were treated to some impromptu pacers - 3 or 4 lyrebirds. I love these birds. Often at Woodford I stop on runs when I hear one and listen for a while doing their imitation acts of other birds. This time I think we startled this little mob and they did their best 'roadrunner' impersonations up the trail, looking for a break in the vegetation to escape into in. I find it very amusing when this happens. Once a quail did this on a rather tight trail with thick underbrush on the Bees Nest Loop and ran about 200m along the trail with me, trying in vain to find a spot to hide but couldn't. Oh to have wings that work! I could have done with a pair of wings here too! Every little up Vajin was pulling away and I think it was here that I knew that I had to put some serious distance on Vajin on the downhill if I had any chance of holding him off as his climbing was just so much more superior. 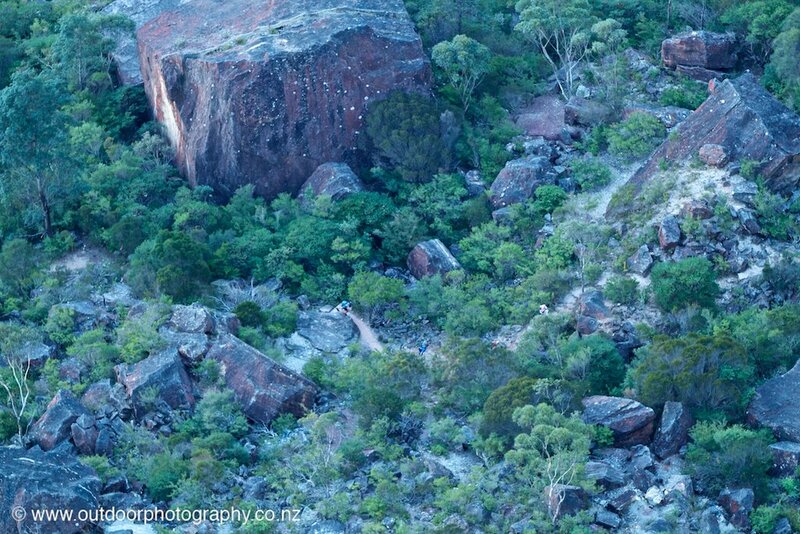 Once we started the long descent to Megalong Valley I let the clutch out and just freefell to the bottom. I caught Vajin who actually apologised for getting away from me on the hills! I continued on with my plan, ignoring full well the pain my quads were going to give me in the following days as a result. Plan good, execution good, problem was Vajin didn't cooperate! Turns out this guy can freefall pretty quickly too and we ended up pacing each other pretty solidly to the bottom. I knew then my task just became twice as hard and realistically I would now be looking at holding onto 3rd spot instead of battling for 2nd. Once at the bottom, Vajin predicatively pushed on incredibly strongly up the climbs while I down-geared and did my best to keep up a good rhythm. I love the exposed section after the first creek crossing. The vegetation changes slightly and the views to the left are incredible. I ran all of this and pushed to the second creek crossing. Vajin was nowhere in sight. So the Kedumba push started and my main goal was to run to the first left onto the main firetrail which I pleasingly did. Here we stopped for a gear check and the guy encouragingly let me know I wasn't too far behind Vajin. From there the firetrail just gets ridiculously steep and while I've run all of this part (or longer still) many times previously, I've never done it with 80 odd kms under the belt! I got to the stage where I think my running was as slow as walking so I changed to a powerwalk. Last year Damon Goerke passed me here while walking so I thought if it is good enough for one of the best trail runners in the land it's good enough for me! I managed to walk the steep bits and run the flatter bits and I thought this was probably the best I could do at the time. I reached the top and ran strongly to CP5 still holding down 3rd so decided then that it must have been a pretty good leg overall. I fluffed around a bit a CP5, last year I did what Andy Lee did this year, the 'grab and go' but I felt obliged to stop with my wife, my best mate, my mum and her partner there. I'm glad I did, the minute or two break gave the heart rate time to relax after the epic ascent and to see their collective pride and hear their well wishes. I was surprised to see the ever encouraging and all round great personality Great Fortmann there. 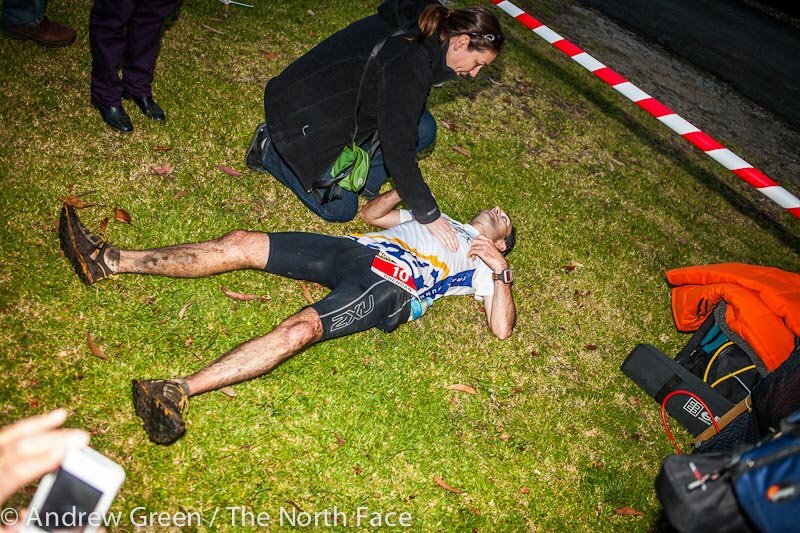 She was just one of many of the elite field that succumbed to misadventure during the course of the race. I was really intrigued to know how far fourth place was back, but no one had any idea. I was half thinking someone may have been watching the Live Tracking that had been set up. Regardless, I left the checkpoint with a nice big fix of Coke pulsing through my veins knowing that at any time someone, a much better hill climber, could be on my tail. The road was a godsend after the kms done on the trails. My feet were aching and to be back on road felt like returning to a comfortable chair. I was back in my element. I received a text message half way up the hill to Hordens Rd and knew this was my crew telling me that the 4th place runner had just come in. It seemed I had a km or a bit over at best to spare and I really thought that this and the way I was running would be enough to hold down 3rd. Wrong. Very Wrong. The last 5km of this course are as brutal as any other part and just so difficult on tired legs. The never-ending stairs that break up your rhythm, run unnaturally and force you to take their lines are my nemesis. 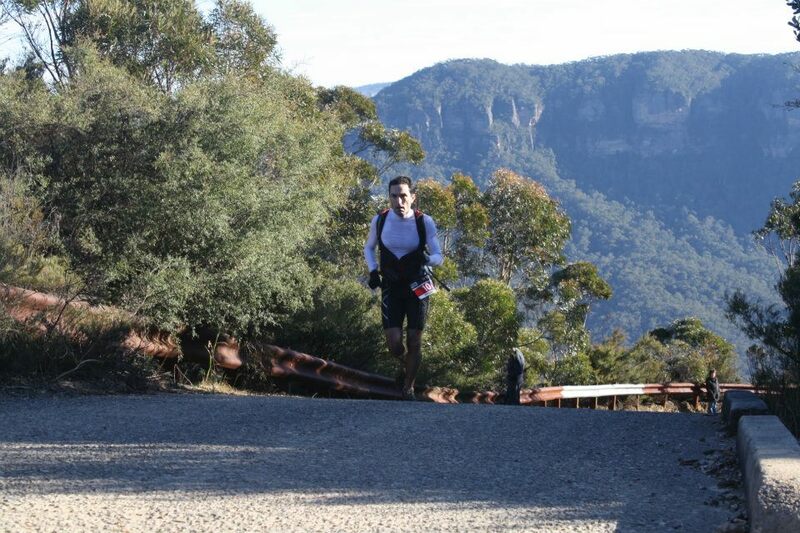 A short way past the rock overhang at about the 95km mark Andrew Tuckey cruised past. I was expecting Andrew to do this a lot earlier in the race, but all credit to him, he paced his race out beautifully. What a smashing debut from him too; the road 100k must be on the horizon for this classy runner. With that rather irritating occurrence over, I got on with the job of finishing the race off, anyway I could. I was sure I still had sub 10h in me. With 2km to go there was 13 minutes to get it. Again, you just can't underestimate the difficulty of the last section. I'm sure Ryan Sandes probably thought he had Killian's record in the bag too, it is just so technical and inhibiting to free, quick running. It didn't stop me trying however...for at least 2 metres anyway. I gave it one last big push but fell flat on my face. Tired legs, tired mind, fading light. Not good for running techy trail. With my pride dented due to the fall, I cruised the rest of the way, walking some of the stairs. I made sure I ran strongly the Fairmont part to make it look to the spectators like I was full of running! 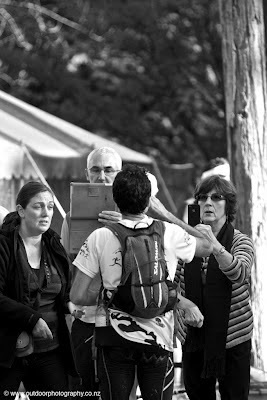 Crossing the finishing line, I promptly fell to the ground, feebly shook a few hands and looked for some hole to die in. It was over; 22 minutes and one place better than last year. I can't complain! A real shame that some of the strong men, including Jez Bragg could not compete on a level playing field. All credit to him for finishing the race so strongly. The vandals that removed the course markings ruined for athletes, spectators and organisers alike a really packed 'front end' of the race. I think my place is rather misleading because of this maliciousness. Secondly, I don't want to say that the World Champs were still in my legs, but I can say with all certainty that training leading up to this race did not contain enough hill work, due to the amount of road training I was doing. If there is one piece of advice I always give to anyone; you must train specifically for the event to get the best out of yourself on race day. Thirdly, I have to change my hydration pack. The Salomon one I used this year was great practically, but it did make me look like I should be leading a float on Oxford Street! Last of all, thanks to Nadine for sharing the experience with me and being a great crew and loving support, all my friends and family for the encouragement before, during and after. I'll be back next year! Hey Brendan, great read. It's nice to know you run like me. You sound so relaxed as well as humble competing amongst the best runners in the World. Brendan you a fantastic role model.